Our Book is now LIVE on Amazon and Barnes and Noble - Please purchase today for $3.95 (e-book), $9.99 Paperback. 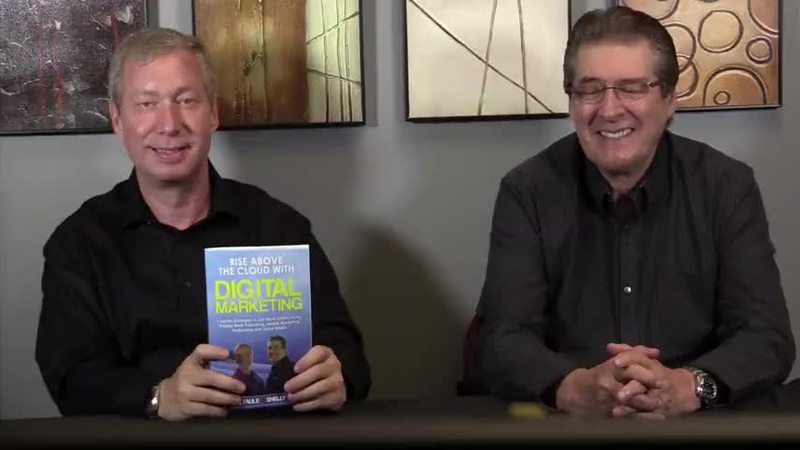 FREE Trial Membership in our Digital Marketing Mastery Training Portal. Email us your original Amazon receipt at: Join-RiseAboveTheCloud@InstantCustomer.com. Note: not a screenshot or PDF. Michael (Mike) Paule is the President and founder of Mobiledata360. As a successful entrepreneur with nearly 30 years of experience in finance, marketing, sales and technology consulting, Mike Paule developed relationships with some of the leading companies and organizations in the Country, including multiple Fortune 500 companies, many law firms, (Local City, County, State and Federal agencies), healthcare organizations and many others. After selling his last business in 2011 he started MobileData360, LLC and has generated nearly $6 million in sales in the past few years. Mike is known as an innovator and a pioneer in on-line (cloud-based) solutions for businesses going back to the late 1990s. Early on in the development of on-line technologies, he recognized the tremendous advantage that these technologies could hold for the business community and has amassed a tremendous amount of expertise in the deployment of cloud-based solutions and marketing strategies, In his prior venture, he helped businesses large and small go digital with their information management needs and he takes great pride in the long-term business relationships he fostered with many of his customers. Recognizing the power of mobile technologies and video as an important customer engagement tool, Mike has partnered with some of the leading experts in marketing, video, social media and mobile technologies to offer his customers substantial expertise in helping them harness the power of today’s solutions to build or expand their customer base, automate their marketing campaigns and properly develop their online presence. In addition to his extensive business background, Mike is a passionate and dedicated community leader and currently serves as a local publicly elected official (Councilman and Water District board member). He also serves in leadership roles on several non-profit foundations and was recently elected as President of the Ventura County Special Districts Association. Michael has received a number of awards and recognition for his business success, innovation and community involvement, including being named one of the top 25 most important people in the Conejo Valley (2013), the 2005 Edward M. Masry Integrity in Community Service award and the 2012 recipient of the Golden Acorn award for community service. As a close friend and former business associate of Mike Paule, Shelly has rejoined with Mike again as Senior Marketing Consultant of MobileData360, LLC. After having served in the Military, Shelly began his career with Bache & Co, a major member of the New York Stock Exchange. He later joined the Value Line organization in New York as an Executive Vice President and Chief Operating Officer of Value Line Securities, a division of Value Line and The Arnold Bernhard Co. While at Value Line he created a sales training program utilizing audio and video applications called “Applinetics”. This ground breaking sales and marketing program was sponsored by value Line and widely used by other major Wall Street Securities firms. He later joined the Piedmont Capital organization in California to head up their West Coast securities and Insurance marketing operations. There he was responsible for the supervision and sales training of over 160 licensed securities and insurance sales people. Several years later, as President and CEO of Tristar Oil & Gas, he created a subdivision called “Thermoil” and generated a successful and documented record of more than 8 million dollars of Investor profits before selling the company to a major, Oil & Gas Company in Denver, Colorado. As an inventor, Shelly created the board game of “Qumero” which he licensed to Coleco in New York and Spears Games in England. As a manufacturing entrepreneur in the confectionery industry; he founded the Beverly Hills Confection Collection in Los Angeles and created a unique gourmet product along with an exclusive method of manufacturing it. Prior to selling the company, the award-winning product was distributed throughout airports and up-scale hotels nationwide and exported to Japan. Throughout his career, Shelly has served as President, Chairman, Director and/or CEO of both public and private companies, which were diversified in a number of fields, including finance, securities arbitration, telecommunications, energy, manufacturing and e-commerce. MobileData360, LLC © 2015 All Right Reserved.